There is a special attached seal on the back of this print. If you click on the image it will enlarge and you will see the seal in the upper right of the screen below a small version of the front. Click on the seal to see it enlarged. It reads: "San-hyaku mai kagiri zeppan, dai nanajūshi go, Torii Kotondo (for foreign export, limited edition of 200 printed, number 74, by Torii Kotondo)". There is also a "Made in Japan" ink stamp on the back, too, plus a handwritten in pencil notation that says: "Senjin Torii - Red Kimono". 1) In 鳥居言人 Torii Kotondo, Gallery Beniya, 1995, p. 26, no. 17. 2) In black and white in 近代日本美人画展 : 伝統木版画を支えた作家たち Exhibition of Modern Japanese Beauties: Meiji, Taishō, Shōwa, Riccar Art Museum, 1982, n.p., no. 83. But this image is also printed in color on the cover of this exhibition. 3) In Ukiyoe Museums in Japan (Nihon no ukiyoe bijutsukan - 日本の浮世絵美術館), vol. 3, p. 43. 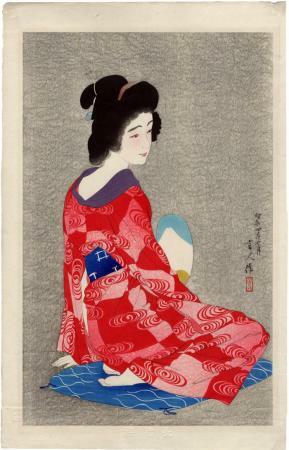 This example is from the collection of the National Museum of Modern Art, Tokyo. 4) In black and white in Japanese Woodblock Prints: Tourist Library vol. 10 by Shizuya Fujikake, 1953 edition, p, 96. 5) in color in Japanese Prints: Images of the Floating World, Barry Davies Oriental Art, #205, illustrated on p. 215.